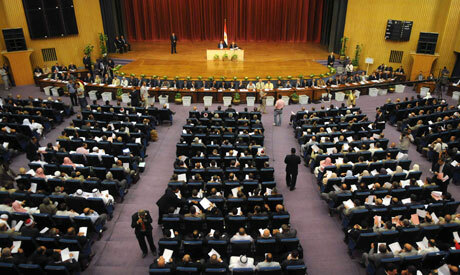 Egypt's constitution-drafting assembly convened Tuesday evening to choose the heads of its sub-committees and approve its code of conduct. The session took place on the same day as the Administrative Court postponed its decision on the assembly's constitutionality until 4 September – a decision that could lead to its dissolution for the second time. The assembly's executive bureau will meet Wednesday to prepare for the assembly's first session on Saturday. Headed by Judge Hossam El-Ghariani, the assembly held its second and last preparatory session at the headquarters of Egypt's upper house of parliament, the Shura Council, which is tasked will presiding over the constituent assembly's work. Ghad Al-Thawra Party head Ayman Nour and Wasat Party head Abul-Ela Madi were elected deputies to El-Ghariani. The Muslim Brotherhood's Amr Darrag was elected secretary general of the assembly while independent MP Wahid Abdel-Meguid was elected its spokesperson. The assembly also voted on its code of conduct, the highlight of which is the change in the method of selecting the assembly's replacement members. It was previously decided that the person with the highest number of votes who had failed to make it onto the assembly would automatically replace any member who left the assembly. Now, all 50 people on the list of replacements will be voted upon by assembly members and the person receiving most votes will enter the assembly. The assembly's sub-committees will start their sessions on Saturday and in future convene each Monday, Tuesday and Wednesday. The assembly's four main sub-committees are basic principles, rights and freedoms, system of government, and regulatory bodies. There will also be a committee to receive suggestions about the constitution from outside the assembly, for example the Journalists' Syndicate, and another responsible for the wording of the constitution's articles. Assembly members will be able to sit on a maximum of two sub-committees. As well as working under the threat of dissolution by a court order on 4 September, the assembly faces an additional challenge from last week's changes to the temporary constitution by the ruling military junta. The junta gave itself the power to dissolve the assembly if it “encounters obstacles that prevent it completing its work” (Article 60B). In such a scenario, the junta can now form a new assembly in its place, because the parliament, which was in charge of forming the assembly, was dissolved by a court ruling on 17 June. If the court declares the assembly unconstitutional, it will be the second one to be declared null and void by a court ruling. The first assembly, elected by the Islamist-led parliament, was dissolved when a court rendered it unconstitutional in April. The first assembly was criticised by many observers due to the preponderance of Islamist members (66 out of 100) it contained. During the negotiations leading up to the formation of the second assembly, a satisfactory deal was reached between Islamist and non-Islamist parties over the membership ratio, but the non-Islamist figures accused their Islamist counterparts of breaking the deal and attempting to secure a voting majority of Islamists once again in the assembly.